Say what you want about the privatization of British Rail, there are some positives, including a massive investment in new equipment, and subjects that are pretty interesting for photographers. 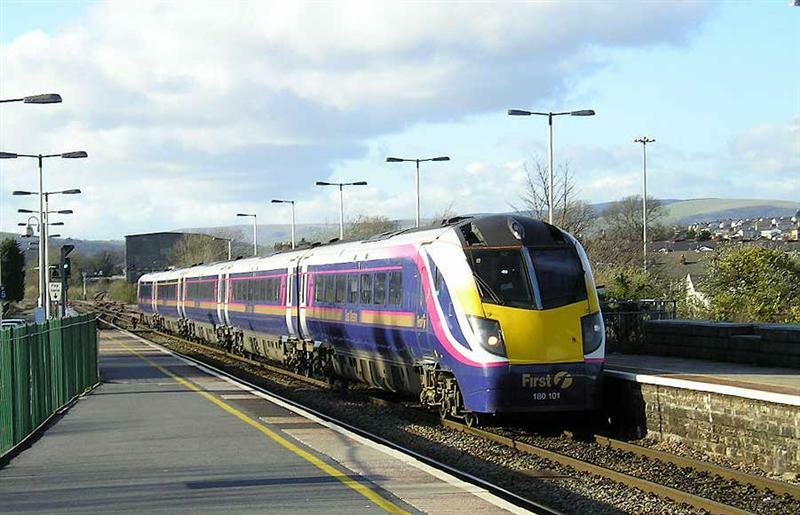 Here's a First Great Western Class 180 Adelante multiple unit articulated train, photographed at Bridgend, Wales, in April 2004 on its way from Swansea to Cardiff and points east. Designed to run at speeds up though 125mph, each five car unit has a small buffet area and a quiet coach, as well as first and standard class seating. The trains are light, but accelerate well and on smooth roadbed quite comfortable. Rumor has it that they will be moved to other parts of the country as Great Western modernizes its Hight Speed Train sets. Oh, and I like the name. Photo taken with an Olympus D-560 digital camera. There is serious talk about the State of Vermont supporting two-trains-a-day service on the line from St. Albans down to New Haven once it receives new sets of Colorado Railcar DMU's and a demonstration project is successful. 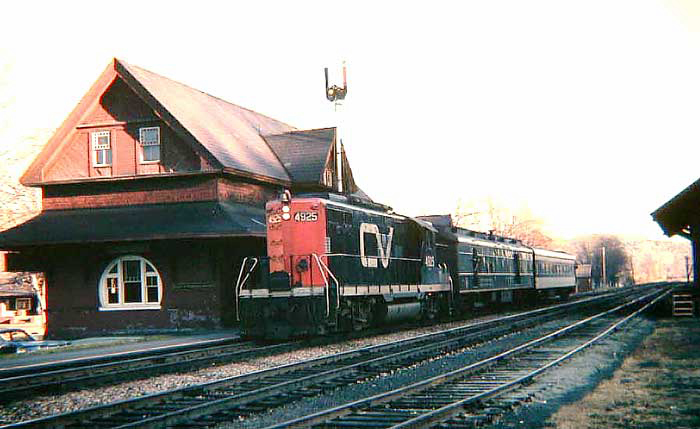 They would replace the existing Vermonter, which goes all the way to Washington. This sent me scurrying to my archive, where I found a favorite photo from 1965, a shot of the Ambassador, a day train from New York to Montreal, which ran over the New Haven, Boston and Maine and Central Vermont Railroads. It's shown arriving in the small town of South Royalton, Vermont, not far from White River Junction, complete with railway post office. In those days there were two trains each day (the other being the overnight Montrealer/Washingtonian, which went all the way to Washington), and it would be great if we can head back to something resembling that level of service in a part of the country where there are few airports, sometimes harsh weather and growing tourism. It would also be terrific to see DMU's, which are used very successfully in many parts of the world, in an American revival -- surely an incentive for other states to start supporting services. The camera was a Ricoh 35mm rangefinder, which replaced my first camera, a Kodak Signet, stolen in the Englewood Union Station in Chicago. The original slide was digitized with the help of an Olympus 2020z digital camera. May 26, 2007. 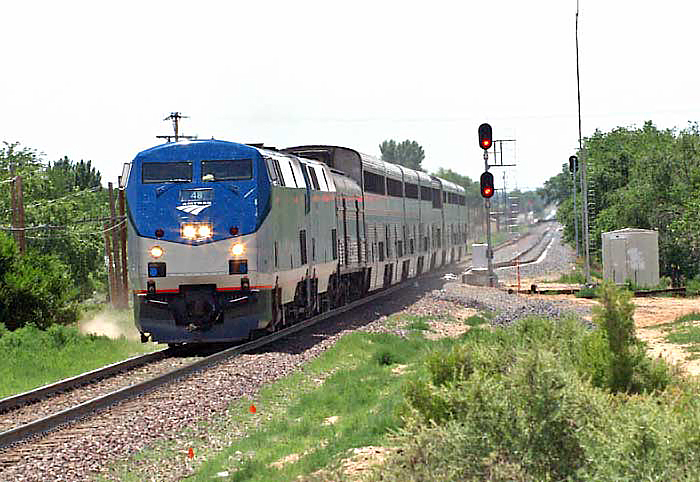 Here's the eastound Southwest Chief at full speed through Bernalillo, New Mexico, near the new Road Runner Sandoval Co/US 550 station. The train was spot on time, and it looked squeaky clean. A great sight. The next day I spent some time talking to passengers and crew during its lengthy layover in Albuquerque. The consensus was a friendly train with inexcusably "crummy food." As one employee put it, Amtrak "spent millions" on a scheme to convert sightseer lounges and dining cars to new diner-lounges and quietly abandoned it. Now they have one chef trying to turn out huge amounts of breakfasts, lunches and dinners, depending not on human help which has been laid off, but microwave ovens. If they can do real food on the Empire Builder, what about trains like the SW Chief which are in great demand, are well run, and embody tremendous traditions? Even the miserable legacy airlines are improving their food and are reviving the concept of 'customer sercvice'. Lets hope Amtrak gets on board. Camera: Olympus E-330 DSLR camera with Sigma 55-200 telephoto lens at 150mm (35mm equivalent of 300mm). Sunday, May 27, 2007, Albuquerque, New Mexico. On the right the tail end of the Southwest Limited, on its way to Los Angeles. On the left, the gorgeous tour train owned by Grand Luxe Rail Journeys, getting ready for a nine day trip through the West. 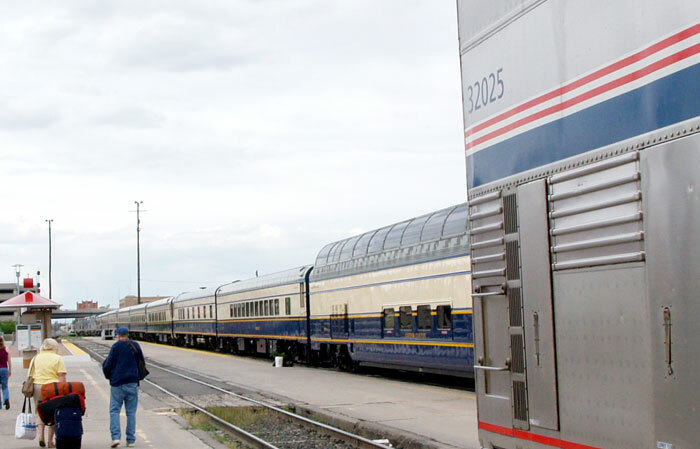 Grand Luxe, a new company headed by Tom Rader, founder of the Colorado Rail Car Company, not only took over and renamed the American Orient Express, but immediately cut a deal with Amtrak to schedule a large number of off- summer season trips on which Grand Luxe cars will be attached to the Southwest Limited, California Zephyr the Silver Meteor and other trains. This premium service will return truly first-class service options long missing in America. We're curious to know what pro-passenger groups like the National Association of Railroad Passengers (NARP) think about this. Does it give Amtrak a green light to further downgrade food and sleeper options? Or, does it open the door for enhanced Amtrak revenues and proof positive that Americans will pay for true first-class service on a point to point basis? I did not have time to tour the train, but I looked through a lot of windows and saw everything from a full computer work station to beautiful place settings in utterly elegant surroundings. My guess is that Colorado Rail Car will build a new tour train for Grand Luxe and this new experiment may become a year round service. I'm saving my pennies....and polishing my lenses. CLICK HERE for the Grand Luxe website. CLICK HERE for Amtrak's release. Camera: Olympus E-330 dslr with Olympus 14-54 lens. Changes last made on: June 18, 2007.